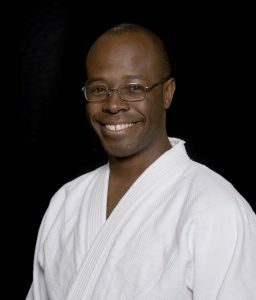 Professor Thabiti Sabahive began his study of Danzan Ryu Jujitsu in 1984 at the age of 11 at the Westside Family YMCA Dojo in LA. A student of Professor William G. Randle since 1994, Professor Sabahive is currently a 6th Degree Black Belt in Dan Zan Ryu Jujitsu, and holds the additional titles of Senior Instructor with the American Judo and Jujitsu Federation, and Kaidensho (Certificate of Full Transmission), with the title of Kyoshi, from the Kodenkan Danzan Ryu Jujitsu Association. Master Sabahive began teaching weekly classes at Asheville Sun Soo in 2010 in order to provide fundamental rolling, falling, escape, and joint locking skills to adult Tae Kwon Do students. These initial classes evolved into a 3 class/week jujitsu program for adults, and a twice per week jujitsu class for kids who are members of the Asheville Sun Soo Black Belt Club. In July of 2016, Master Sabahive was invited by Asheville Sun Soo’s Founder and Resident Master Instructor, Master Morris, to become a full time member of Asheville Sun Soo’s instruction staff. Danzan Ryu Jujitsu is a style of traditional jujitsu that focuses on methods of throwing, and controlling an opponent by using by using their own energy against them. Master Sabahive complements his study of Dan Zan Ryu with additional training with high level instructors across other martial arts, including various systems of Jujitsu, Karate, Tae Kwon Do, Kempo, Kung Fu and weapons. As a student of Danzan Ryu Jujitsu, Master Sabahive is extremely accomplished physically and constantly seeks to refine his advanced technical skill. As an instructor, he teaches with an exceptional emphasis on safety and realism. His instruction is clear and detail oriented and he provides patient instruction to students of all ages and skill levels. His dedication to the art and to being in a state of contribution is apparent through the regular time he spends on the mat, providing his help and expertise to all of his students. Master Sabahive’s education background includes majoring in Physics at the University of Hawaii in Hilo. He is also a graduate of Module 2 from the Danzan Ryu Seifukujistu Institute, which includes a body work certification and other healing arts expertise. As the Resident Head Instructor of Dan Zan Ryu Jujitsu, Master Sabahive has the additional distinction of being the Director of Sun Soo’s After School Program. Master Sabahive has 8 years of experience directing YMCA afterschool and camp programs in his hometown of Los Angeles. The Asheville Sun Soo after school program operates Monday through Friday, from school pick up time until 6 pm, and includes high level tutoring, snacks, games, and outdoor time. The after school program also operates all day during snow days and teacher work days. Master Sabahive is excited to support the academic, social, and character development of the kids in the Asheville Sun Soo afterschool program this fall.